“If you have it, it is for life. It is a disease for which there is no cure. You will go on riding even after they have to haul you onto a comfortable old cob, with feet like inverted buckets and a back like a fireside chair”. Robert Pickles understands the sentiment entirely. He started riding at the age of six and has never looked back (although it should be added at this point, he has not yet reached the comfortable old cob stage!). By the age of 11 Robert had joined the Western Hunt Pony Club where he went on to represent the branch on the Prince Phillip Cup Team at inter-branch show-jumping and Horse Trials. This was the beginning of a long and successful career as a rider, trainer, coach, BHS examiner, NVQ Assessor, and judge. Robert is fascinated by and passionate about horses – he is inspired by the great riders he has trained with – he takes great pride in both the horses and riders he has influenced. Over the years he has found himself in many different situations and yards. He has successfully competed in most disciplines and on a wide variety of different breeds and types. His flexibility has been and still is, a great strength, and because of this wide ranging background he now finds his skills are sought after by a wide ranging clientele. 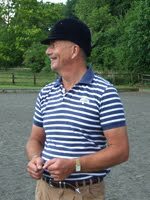 He enjoys the challenge of teaching people from all sorts of walks of life, at all different levels and on a wide variety of types of horses. His current clientèle range from the ages of 7 to 70. He coaches riders from Pony Club to Grand Prix. 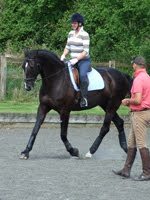 He is as happy to get a hairy cob moving forwards and freely as he is to get an advanced dressage horse to perfect its Freestyle Test. It should not be forgotten that he evented up to Intermediate level and enjoys teaching riders to jump as much as he enjoys inspiring their flatwork. 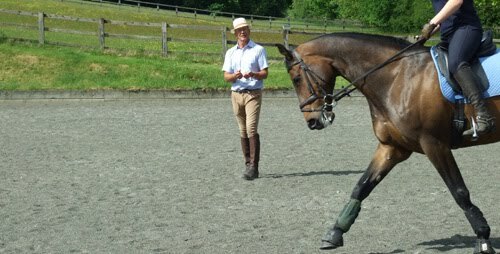 Robert is very rider focused: as a rider, trainer and judge he is used to looking at the rider from all three angles. He has great empathy with riders and understands how one rider can easily perfect a movement where another one will find it extremely difficult to execute. Robert will concentrate on bringing out the best an individual rider can offer not drill them with exercises which ‘should be good for them’. He is equally horse focused: as a rider, trainer and judge he is also used to looking at horses from many different perspectives . 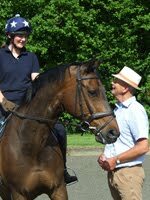 He has worked with so many different types and breeds over the years that he has great insight into an individual horses’ capability; which buttons to push; how much to expect from them according to their age and experience; and when to reward them for doing their best. 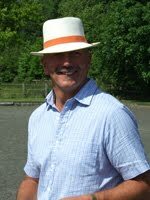 Robert is currently teaching from Kent to Cornwall and makes regular visits to the Isle of Wight. 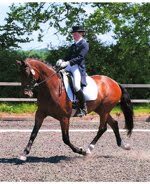 He is popular with a number of clubs including: The Cornish Dressage Group; The Southern Dressage Group; The Isle of Wight Riding Club; The Solent Riding Club; Barewood and Wokingham Riding Club; Winchester Riding Club; Limpsfield Riding Club. How would you sum up Robert? He is approachable, flexible, fun, competitive, enthusiastic, dedicated - he wants to see a result and will make every effort to get it. He wants to achieve high quality work – it does not have to be high school movements – it just has to be correct. If both horse and rider are smiling at the end of the lesson he knows he has achieved. For information on private lesson, fees, and availability please contact him directly.